Patterson’s first official workshop dedicated solely to local cannabis regulation, drew a large cross section of residents that invariably showed their support in allowing for some sort of cannabis businesses and cultivation, whether it be medicinal or recreational, or commercial or personal in nature. The meeting was moderated by Churchwell White Legislative Advocate Josiah M. Young, who began the workshop by providing background information regarding the passage of the Adult Use of Marijuana Act (AUMA) otherwise known as Prop 64, as well as Patterson’s specific laws currently in place that outlaw cannabis dispensaries, as well as the outdoor growing of cannabis. Following the presentation, attendees were allowed to respond to ten separate questions by placing a green or yellow dot next to either “yes”, or “no”, and “medical” or “recreational” questions presented on sheets of poster board placed around the room. Attendees to the meeting that did not reside within the city were asked to use orange dots, though the majority of dots were either green or yellow depicting that those mostly involved lived in the city. 1) Should Patterson allow commercial cultivation? -Invariably yes, for both medical and recreational use. 2) If commercial cultivation is allowed, should it be indoor or outdoor? -The strongest support was shown for indoor medical and recreational cultivation, with strong support shown for outdoor medical or recreational cultivation. 3) How many plants should Patterson allow for indoor cultivation of personal use medical marijuana? None, 6, 9, 12, or 13+? -No stickers indicated none, with more emphasis placed on 9 through 13+. 4) how many plants should Patterson allow for outdoor cultivation of medical marijuana? None, 6, 9, 12, 13+? -Some stickers indicated none, while the majority responded to allow some number of outdoor growing to be permitted. 5) Should Patterson regulate indoor cultivation of personal use recreational marijuana ? 6) Should Patterson ban outdoor cultivation of personal use recreational marijuana? 7) Should Patterson license the following marijuana businesses? Manufacturing, testing, transportation, distribution, none of these? -Unquestionably yes to all of the above for both medicinal and recreational. No stickers were placed on none of these. 8) Should Patterson enact a local marijuana business tax by ballot initiative? 9) How many dispensaries should Patterson allow? None, 2, or 3+? -Most stickers were placed on 3 or more dispensaries to be allowed in Patterson. 10) Should dispensaries be allowed to deliver? Following the community input portion of the meeting, workshop attendees were asked to provide any public comment on the matter. 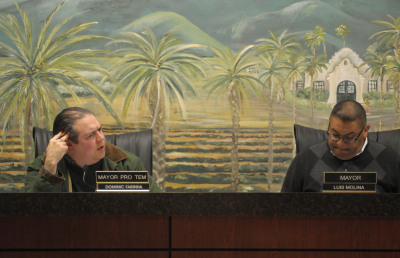 No one from the public spoke in opposition to allowing recreational or medicinal cannabis uses within the city, though Vivian Ratliffe wanted to hear what our local Stanislaus County Sheriff’s selection for Chief of Police, Jeff Dirkse had to say. Dirkse stated that the black market on cannabis will be alive and well regardless of Patterson’s decision on cannabis laws and was quick to compare cannabis use with alcohol use. Dirkse attempted to have the last word during the meeting, though workshop attendee Barbara Langstaff offered up a rebuttal to Dirkse’s comment. “Then have that doctor petition the AMA,” Dirkse interjected. Other attendees to the workshop weren’t buying Chief Dirkse’s rhetoric either. Kiana Weinzheimer, who said she has started a Stanislaus County chapter of NORML, an organization that stands for safe access of cannabis, inquired about future meetings and workshops. 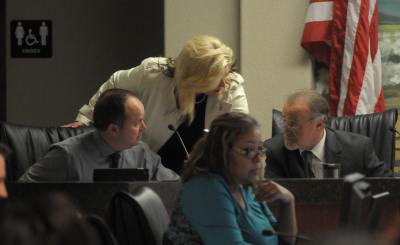 “We are working on planning a future workshop on a weekend day,” City Manager Ken Irwin said. “We’ll evaluate the data then craft more roles and regulations,” Irwin continued. 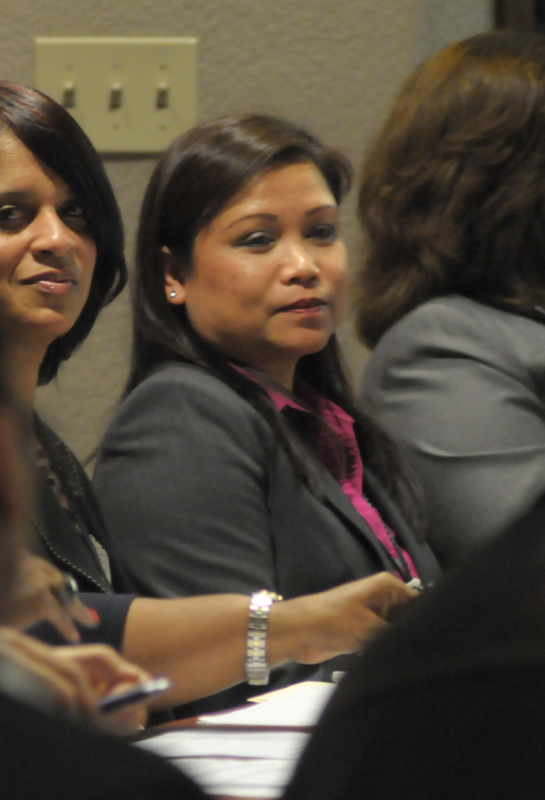 “There will probably be more workshops based on those directions. We have a long ways to go." Attendees were generally pleased with the results of the poster board questions following the workshop. "It looks like everyone's on the same page," Penny Langstaff said. ​"I'm really excited to see this many people come out and get engaged," Justin Danner said. This meeting took place at 6 p.m. Tuesday March 28 at the Hammon Senior Center. A future cannabis workshop date has yet to be decided upon, though city staff has indicated that the next workshop date will likely be on a weekend day to allow for any weekday commuters to be able to attend. 2016 Patterson Mayoral candidate Troy McComak has done a lot of growing up since he first ran for congress and mayor back in 2010. The 31 year old husband and father of two children- Shiloh, and Luke –and man of faith, now has a young family and admits that he’s done a lot more listening and learning since his first attempts at politics. “I’m in the light, I’m heavily involved in church activities, we see great things and we do what’s best for the community, but I used to be in the dark and I’ve seen the underbelly. That’s really what’s driving me is my faith and that’s what keeps me strong I just want to see this town succeed and do better,” McComak said from his home in Walker Ranch Friday evening. After sitting down with McComak for three hours, it’s clear that his reasons for running for Mayor of Patterson, are for all of the right reasons, though many of those reasons came directly from negative reactions in dealing with the city. McComak’s priorities lie with making the city more accommodating to small business, the need for the city’s own police department, and fixing the declining state of the city’s water quality. McComak received a degree in Biological Sciences from Stanislaus State University in 2007 and the self proclaimed scientist has been vocal about wanting to fix Patterson’s problem with hexavalent chromium, or chromium 6, despite some backlash that he’s received from locals about even trying to bring awareness of the issue up. At a recent chamber of commerce meeting which McComak and other local political candidates were invited to speak at, where he brought the hexavalent chromium issue up, he was accosted by members of the chamber for seemingly not knowing what he was talking about. McComak says that there are steps the city can take to clean up the water and he feels that his experience can help make that happen. McComak admits that the first step in fixing the problem, is getting landowners to admit that there is one. “Even the large scale surrounding landowners have contaminated water, and I want them to come forward with out any repercussions so that we can fix their water and make it safer for everyone,” McComak said. In 2015 West Side cities such as Patterson, Newman, and Los Banos were hit with warnings from the government that they were high above the state allowed 10 parts per billion of chromium 6. Well sites throughout Patterson tested above the allowed level and had at least one well test for 36 parts per billion of hexavalent chromium 6. Since then, McComak has overheard city of Patterson officials say that that number is actually higher and closer to 50 parts per billion. “I don’t want my kids to grow up and get cancer, or kidney damage,” McComak said of the health issues associated with chromium 6. Another serious issue facing the City of Patterson for McComak is the lack of the city’s own police force. “I think about that a lot, every time I see a cop I think is that a good cop? Or is that a bad cop? Is he going to talk to me? Am I going to jail today? I am not breaking any laws. I am a legal beagle boy scout and I fear these sheriffs because I don’t know who these guys are in my community,” McComak said of Stanislaus County Sheriff’s policy to typically not allow deputies to serve in their own communities. McComak had learned of the Patterson Police Chief Jeff Dirkse’s decision to get involved with trying to control the local media by spreading lies and rumors about former Patterson Irrigator Editor Elias Funez, even before he was officially sworn in on the job. “You deal with that on a daily basis, that’s your job, for him to do that shows that he has bad judgment and bad character on his part,” McComak said of Dirkse after reading the letter that he wrote to Tank Town Media publisher Will Fleet dated April 21, 2015, nearly two weeks before actually being sworn into a position that no one from the City of Patterson had any hand in selecting. 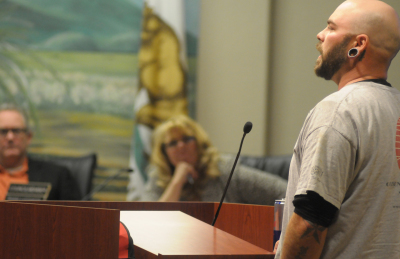 McComak himself claims that he was unjustly treated by the Stanislaus County Sheriff’s department when 12 criminal charges were brought up against him by a former girlfriend with a vendetta, in which all charges against him were eventually dropped. This type of tense control over the public prompted McComak to pull papers to run for the top Sheriff position in the past as well, however a stipulation requiring the top sheriff’s spot to be filled by someone who was once a police officer forced him to step down from those aspirations. Still, McComak knows that there are good deputies within the local law enforcement, including his best friend in Patterson growing up Gustavo Dardon, who is currently a deputy with the Sheriff’s department. McComak’s answer to ending police corruption from within local departments is to initiate an independent internal affairs commission. McComak’s resistance from the City of Patterson in trying to launch his small business was another reason that he decided to get involved and run for Mayor. After getting clearance from the city to work on developing a paintball field at the T.W. 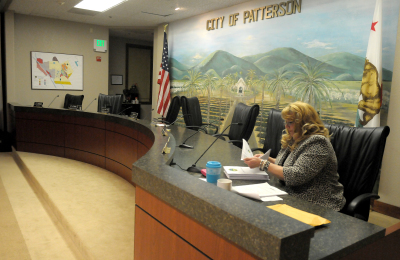 Patterson Sports Complex, and making the proper investments, his efforts were thwarted from a city that he says was not willing to work with him. McComak says he made major improvements to the site at the sports complex by using a bobcat, shovels, a grader and a laser leveler before bringing in 9,000 square feet of high grade astro-turf to the site to be installed. “They invented this $6,000 paintball inspection fee,” McComak said, claiming that the city cited the same fee structure that Amazon was going through had to be applied to his paintball field. “There is nothing going on here that requires a $6,000 inspection fee,” McComak told city officials, which were then demanding payment for occupying the site with his astro-turf, which he says the cost was split with his partner at the time but had spent his life savings investing into his dream of opening a paintball field here in Patterson. McComak felt he was slapped in the face when he found out that his opponent in the race for Mayor, Councilwoman Deborah Novelli, took his turf from the sports park and gave it to the new indoor soccer facility on 1st Street. “Now Deborah Novelli takes my turf, gives it to the indoor soccer facility and she says that she did it? That it was all her? 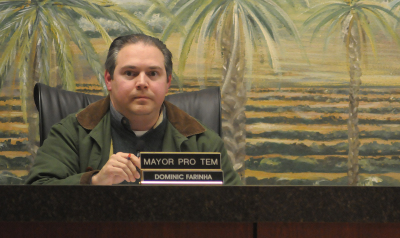 That I supported that?” McComak said after he saw it in a mailer that Novelli recently sent to the city residents referring to her supporting Patterson Indoor Soccer. “I didn’t go after the city though because it’s not like I don’t support indoor soccer and I didn’t want that guy to get attacked or make it seem like I don’t support the kids. So I’m glad it’s being used and not being devoured by squirrels, but I can’t believe she took credit for all that,” McComak said. The situation still didn’t sit well though with McComak who said he had a buyer from Southern California ready to come buy his astro-turf for close to $10,000. Other issues that McComak feels strongly about is his desire to bring a hospital back to the West Side of Stanislaus County and raised his concerns about the potential of becoming isolated from Modesto or Turlock in the case of a natural disaster and said he would lobby state politicians to bring money to this part of rural Stanislaus County in order to rectify that issue. McComak also liked the ideas of preserving Del Puerto Canyon for hiking, biking, and equestrian trails and liked the idea of an outdoor amphitheater proposed by the city’s Parks and Recreation Department to be placed just west of the historic Del Puerto Canyon gateway on the city’s western border. Overall McComak is happy in the direction that the city is going. 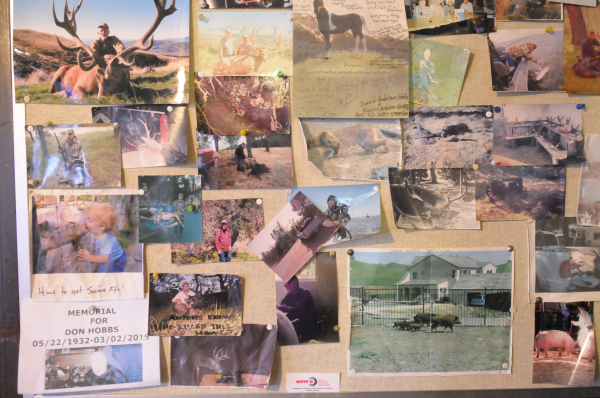 “I had the Bay Area upbringing, which was kind of crazy,” McComak admits before his family moved to Patterson in 1996. “Patterson for us was a huge opportunity to grow up and do better, all three of us kids went to college,” McComak said of his siblings, Trevor, who went on to fly C-130’s for the Air Force, and sister Tarah, who is currently a teacher at Patterson High School. McComak’s older brother Trevor once flew President Obama around the Middle East in 2008 and showed the President a family photo, which included McComak. But fun and jokes aside, McComak, who has been labeled as not taking his political aspirations seriously in the past, has clearly shown that he has matured since first running for Congress in 2010, and still has a lot of positives to look forward to in Patterson. 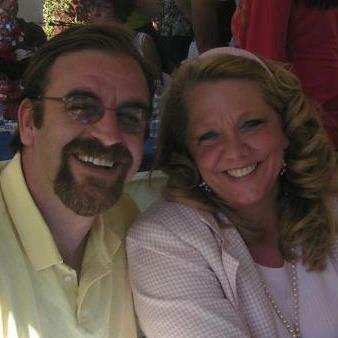 He has been endorsed by almost everyone he’s talked to including the Central Valley Democratic Committee. With a ‘build it and they will come’ attitude, a small group of dedicated hard workers have been busy for the past three weeks in Patterson doing just that, building a venue where they can bring world class musicians and artists home to the Apricot Capital. The two men behind that vision, NorCal Street Team promoter Tony Garcia and local restaurant owner Carlos Roque will get that chance tonight Friday September 23, when musicians from all over the state of California will perform on a brand new stage in a custom built venue for Garcia’s envisioned Backyard Boogie. ~Ital Vibes, an 8 piece reggae roots band from Los Angeles South Bay area who has toured with bands like Fortunate Youth and The Expanders, will headline the event. ~Bachaco, based out of the Miami Florida area will bring their unique mixture of modern reggae rock with Latin influences and brassy sound to the stage as well. ~Prime Livity, also touring with the Ital Vibes crew, rounds out the Southern California Los Angeles based performers that will make it to Patterson today. There will be no shortcomings when it comes to local talent either. The event, hosted by Patterson’s own DJ Trey of Technical Two productions, will be on the mic all night and will close the event with his popular musical selections after the final band performs. Patterson’s E-Jah Selectah, also known as EJ Rodriguez, will begin the evening on the 1’s and 2’s. ~Newly formed local band The Rivits, with Patterson members Daniel Barrientos on the Bass, Robert Mariscal on the drums and Ray on the guitar, who are no newcomers to the music scene, will perform their second performance as a band. ~Up and coming Modesto/Stockton based reggae band Natural Revolutions will kick off the music on stage around 7:00 p.m. If that wasn’t enough talent in one place, Garcia has planned for dance exhibition by a man named Menace, and at least one live artist will produce a mural painting during the evening. The event, which has only been in the planning stages for the past three weeks, was the brainchild of Garcia and the result of him working with various musicians from throughout the area in his line of work. “I was booking Ital in L.A. and booking Bachaco in San Francisco so I couldn’t really pass up on the situation to bring them to my hometown,” Garcia said earlier this week. Garcia, who has traveled to over 50 music and arts festivals this year while working with his music promotion company NorCal Street Team, has been wanting to bring the local talent that he is used to traveling hours to see, here to Patterson for years. He was part of the team that brought Fortunate Youth to Patterson back in the heydays of Patterson’s KeepItLit band, and his efforts in the reggae music industry have only begun to pay off. 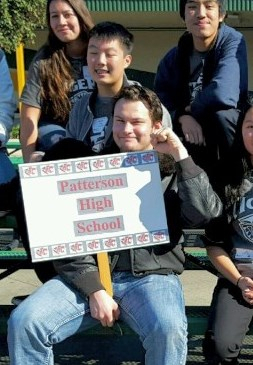 “I wanted to show Patterson what we see out there in the world,” Garcia said of the event. The venue, owned and operated by Roque, is also in its infancy, and sits in between land zoned industrial on the south side of Patterson at 326 Sperry Avenue. It can be easily missed, but nestled in the back of the long property is where the large stage sets with a peaceful backdrop of some old growth pine trees and plenty of space for onsite parking, and potential for a future of festivals to be had. On Thursday, just one day before the show, hammers could be heard pounding, and the sounds of saw blades cutting as the finishing touches were being placed on the bar, which will have a variety of beers on tap as well as some hard alcohol. Sound engineers from Modesto's Jill Ferris productions, who recently purchased the Fat Cat Music House and Lounge's sound system after they closed, are slated to set up their sound system early Friday to ensure that the musicians are received properly. The event is open to 18 and over and alcohol will only be served to those 21 and over. Private security will be on site during the event. Gates open at 6:00 p.m., bands start at 7:00 p.m. The price is $13 at the gate, you can also RSVP on the Facebook event page created for it for a $10 guest list price or text (209) 535-0700. Ladies are free all night, no ins and outs. A $50 VIP pass is also being offered and includes parking behind the stage and access to the VIP section, comes with a meal ticket and one drink as well. 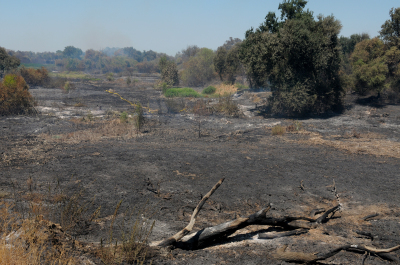 It didn't take long after local fire crews got control of the fire that started last Sunday near Grayson, for them to get called back to the thick San Joaquin River to work on a new pair of conflagrations that are being deemed suspicious in nature. 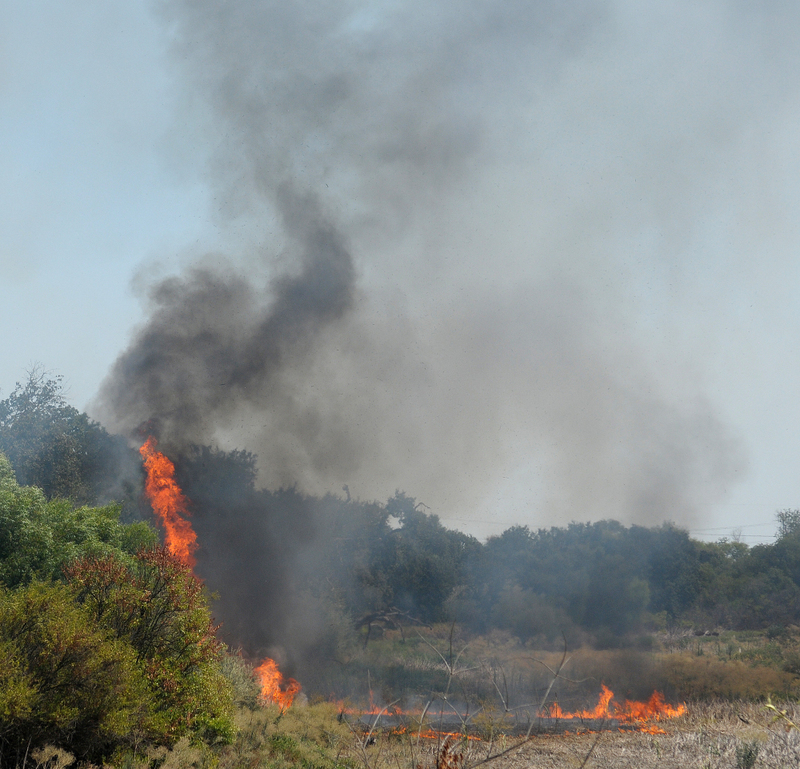 These fires flared up this time near where a fire started July 4 behind the Houk Ranch three miles south of Grayson. 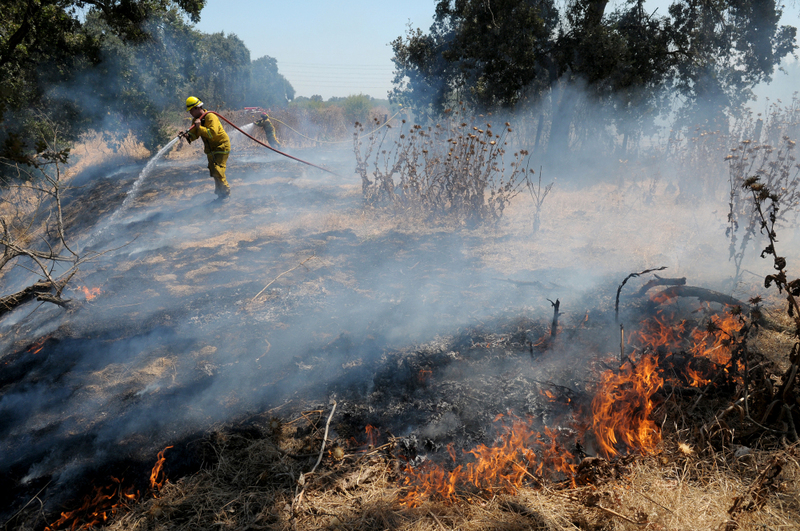 "We were out last night controlling the fire, doing back burns, protecting water pumps," Patterson and West Stanislaus Interim Fire Chief Jeff Gregory said Friday morning. 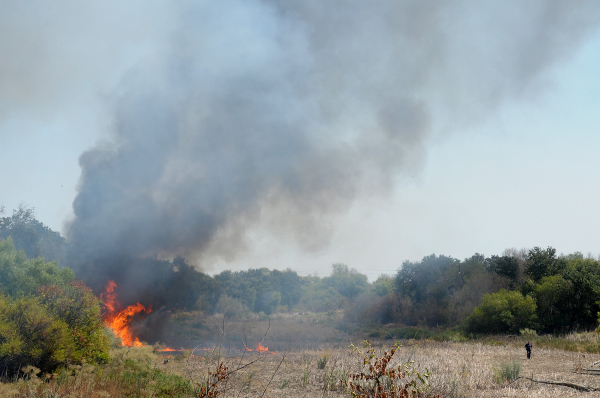 Gregory said that these fires were reported Wednesday evening and that they were too far away from the site of the Grayson fire to have started from traveling spot fires. There is no immediate threat to homes or property at the time. There are some large water pumps out there, but they have been protected from the fire by the fire crews. 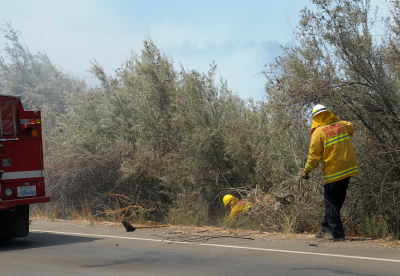 Access for controlling this fire is much easier though for firefighters since there are already established dirt roads that cut through the property, however, the danger of working in that area is similar due to the thick vegetation and danger of snags and widowmakers. 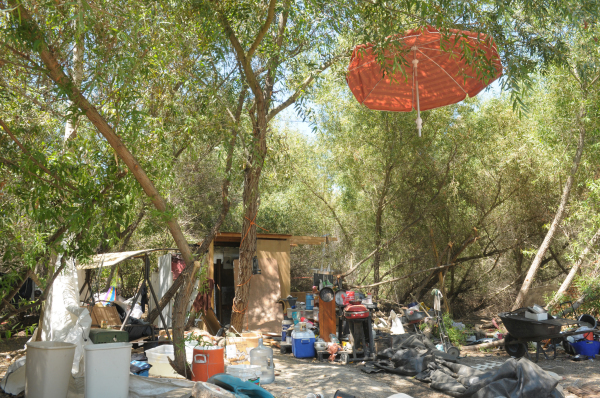 "We're enforcing that people need to stay out of that area," Gregory said. While the Grayson fire is almost completely out, these new fires behind the Houk Ranch are now estimated at 80% containment. 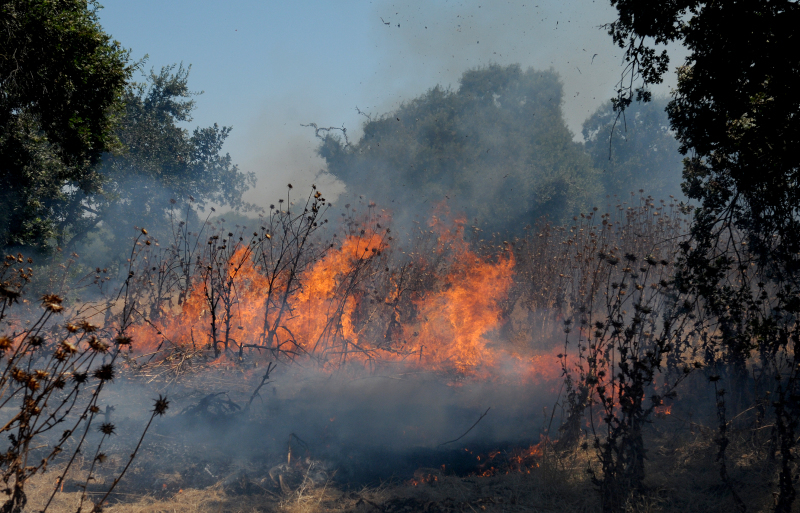 With soot on his face and smoke in his eyes, Patterson and West Stanislaus Fire Chief Jeff Gregory reported that an estimated 200 acres had already burned along the borders of the town of Grayson and along Grayson Rd. 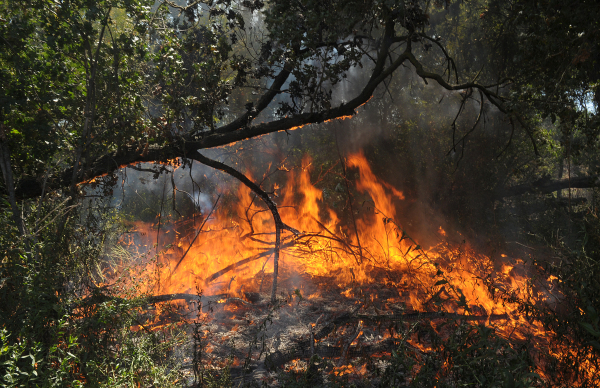 "It's been burning like this for two days," Gregory said, with visible nicks and cuts on his arms from trudging through the thick riprarian brush that makes fighting these types of river fires so difficult. 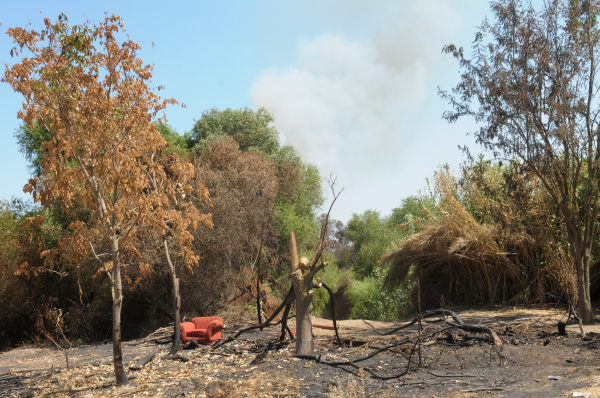 The fire, which began on the afternoon of Sunday August 14 near the eastern end of Minnie St. where a homeless encampment had been erected in the weeds and bushes of the San Joaquin River banks, was deemed suspicious in origin. 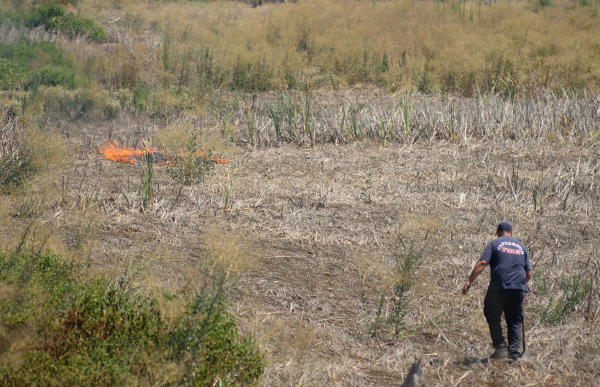 "We have our suspicions," Gregory said of the origin of the conflagration. 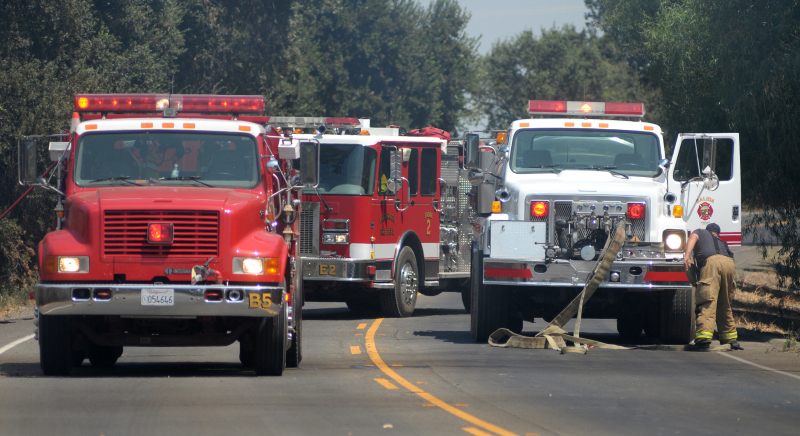 Homes along Stakes and Charles Street were evacuated for a couple of hours Sunday while firefighters battled the blaze, but were eventually allowed to return after the fire moved on. While no homes were damaged, the fire did burn some back yards of homes bordering the river in Grayson, and at least one resident had to evacuate his goats and other backyard animals. 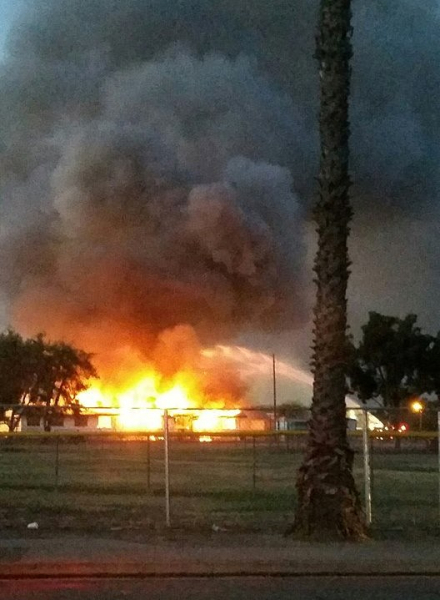 Grayson resident Yesenia Tinoco was coming home from Tracy when she saw the smoke from the fire and began to worry. "Flames were visible in the trees above the houses," Tinoco said from her home Monday afternoon. West Grayson Rd. between Shiloh and Cox Rd. 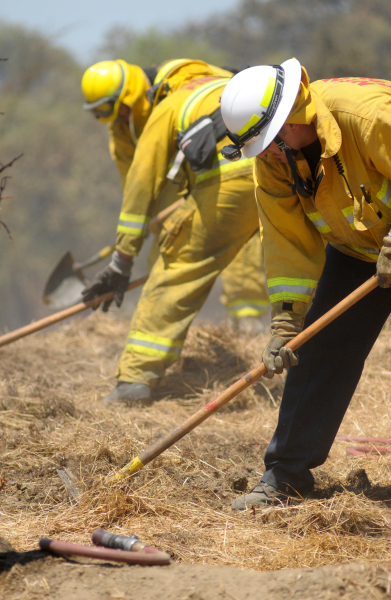 were closed Sunday afternoon and are still closed until further notice to allow fire crews access to the burning mess. 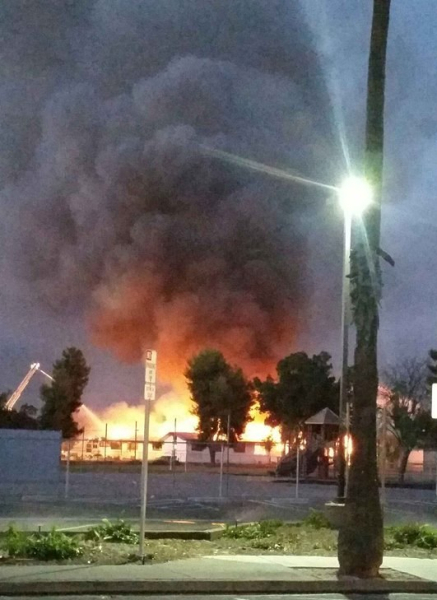 After fire crews got the blaze under control Sunday evening, the fire reignited with vigor once again early Monday morning. 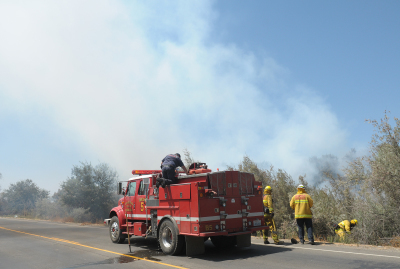 While on the scene Monday afternoon it seemed as if the firefighters had gotten control of the blaze as they quickly took a lunch break before getting back out on the scene putting out spot fires. 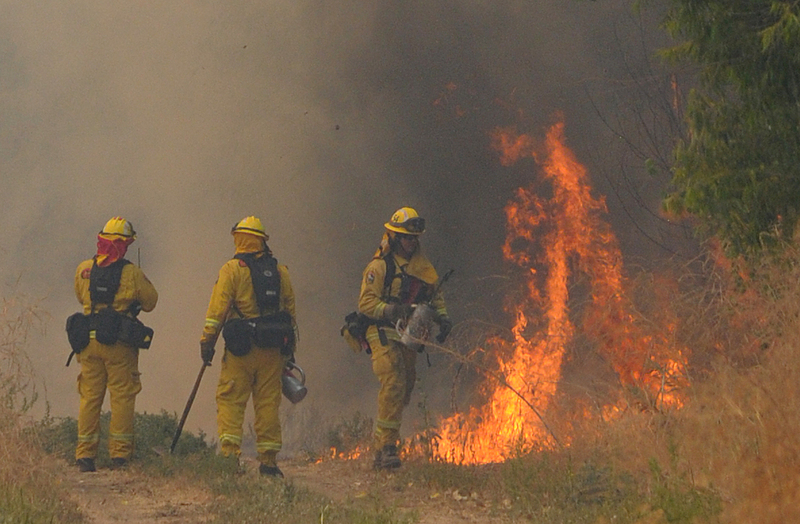 Spot fires grow quickly from hot embers or traveling flames that are carried by mounting winds and begin new fires in different areas. 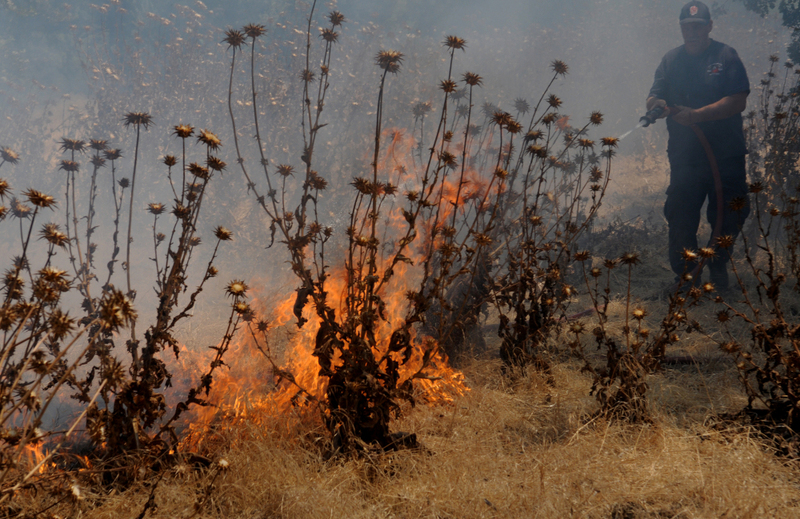 Spot fires can travel feet, yards, sometimes miles and the reported 13 mile per hour winds are not helping. Fire Chief Jeff Gregory, could be seen directing the firefighting operations as well as running from spot fire to spot fire in an attempt to quell them before they could spread and get out of hand. 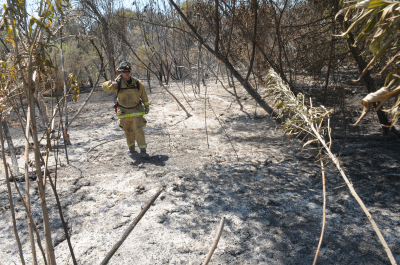 Unfortunately, with mounting afternoon winds, some of the spot fires did exactly that and have enlarged the footprint of the fire tremendously. Joe Hernandez (center) father of the late Dallas Hernandez, tells some of the backstory behind what went into bringing the Dallas Hernandez memorial bench. Standing next to him is Kayleigh Haas, Dallas' girlfriend at the time, and who was also involved in the accident that took Dallas' life..~photo by Elias Funez/The West Stanislaus Journal. The rain stopped long enough Saturday afternoon to allow for a peaceful gathering of about 50 firefighters, city employees, friends, family, and community members who memorialized a city bench in honor of the late Dallas Hernandez, a Patterson Volunteer Firefighter who passed away tragically less than a year ago. Hernandez, who was 21 when he died in a vehicle accident in Merced County last September, had been a volunteer with the Patterson Volunteer Fire Department since he was 17 and was known to be one of the first, first responders on scene during many of the day to day calls in and around Patterson and was known to have a smile on his face and a helpful attitude. His death came as a huge shock to the fire department and the community so the members of the Patterson Volunteer Fire Department, along with the help of Interim Fire Chief Jeff Gregory, came together to get a new city bench memorialized in his honor in downtown Patterson’s City Park, next to the Fire Station No. 1 on Las Palmas Ave. When Chief Gregory informed the public works director of his idea to have an old bench next to the fire station with a new one in honor of Hernandez, he was told that the sidewalk in front of that section of Las Palmas Avenue was slated to replaced anyways and was told that they could have the work done before the annual Apricot Fiesta. “Everybody benefitted, the sidewalk was replaced, which was planned, we got rid of a bench that was falling apart and wasn’t ADA compliant, and we got a nice strong sturdy bench with a plaque in it where people know that he was here,” Interim Fire Chief Jeff Gregory said Saturday. Dallas’ father Joe Hernandez, as well as Dallas’ girlfriend Kaleigh Haas, who was also involved in the accident that took Dallas’ life, were on hand to pay their respects and offer some knowledge of the Dallas Hernandez Memorial Fund which went in to place to help pay for funeral expenses as well as to possibly pay for a scholarship that could cover the expenses of an up and coming volunteer firefighter. For Joe though, the bench was not only a kind gesture towards his family, but also as a reminder for the rest of the local firefighter community. “We know that the bench is away from the firehouse, they need to have a place where they can go away to have a break from what they see day to day,” Hernandez, who now lives in Hollister, said. CJ Sierra, a city employee who is also a volunteer firefighter that worked alongside and was good friends with Dallas Hernandez, was glad to have been able to be on the crew that worked on the memorial bench. “I was really honored to be a part of it because I did the job from start to finish, actually blueprinted it, did the excavation,” Sierra said. The project spanned the course of a couple of weeks after city crews needed to use an axe and pick to get through some mature roots in the ground and utilized 7 cubic yards of concrete to finish the job. But for Sierra and the other crew members that knew Dallas Hernandez, working on his bench meant being able to add their own personal touch to the project as they laid some small personal effects of Dallas’ down beneath the concrete, including some homebrew bottle caps and labels from some of the beer he brewed as well as some shotgun shells that he would use when duck hunting. Others wrote their names on the road base beneath the concrete. 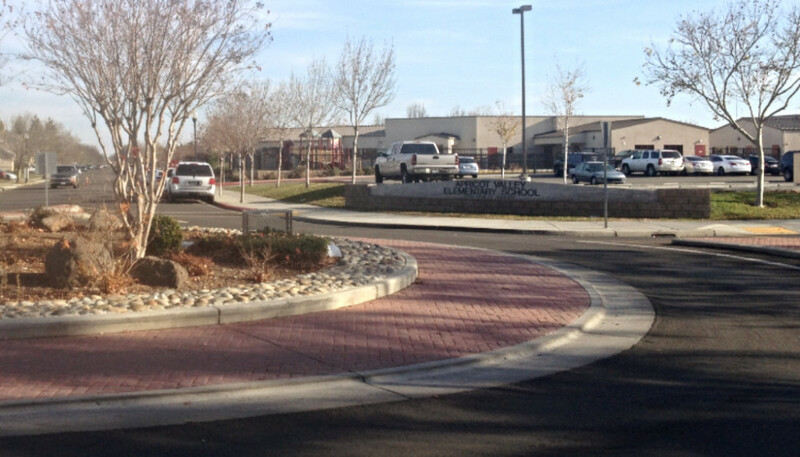 West Coast Turf donated the sod surrounding the bench, and Silicon Casework donated the engraving for the plaque to fit in the bench, and eventually the city plans to replace the rest of the sidewalk along the front of Fire Station No. 1. Below, Dallas' father Joe Hernandez stands with Kaleigh Haas and other friends and family of his son's during the memorial ceremony Saturday afternoon in downtown Patterson's City Park. 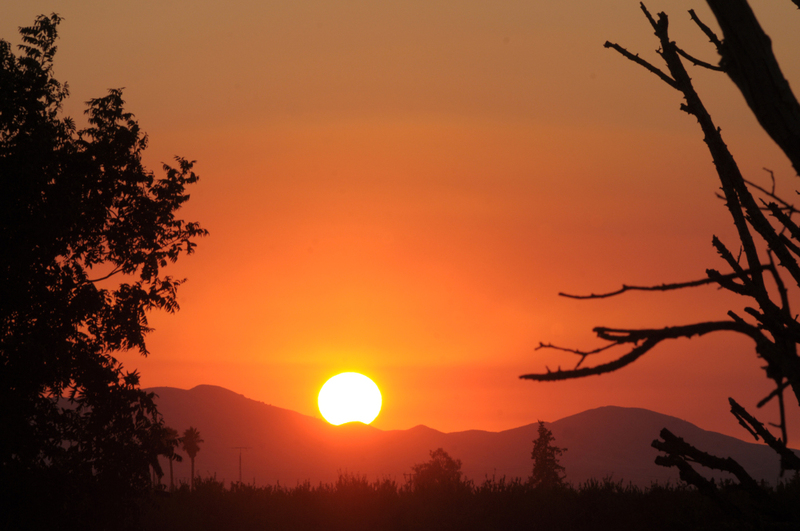 .~photos by Elias Funez/The West Stanislaus Journal. Explorers take to Del Puerto Canyon for first of annual "hikes for health"
Hikers follow one of the many trails through the Minnear Day Use Area for the "easy" hike of the City of Patterson's annual Hikes for Health Saturday February 6, 12 miles up Del Puerto Canyon Road. 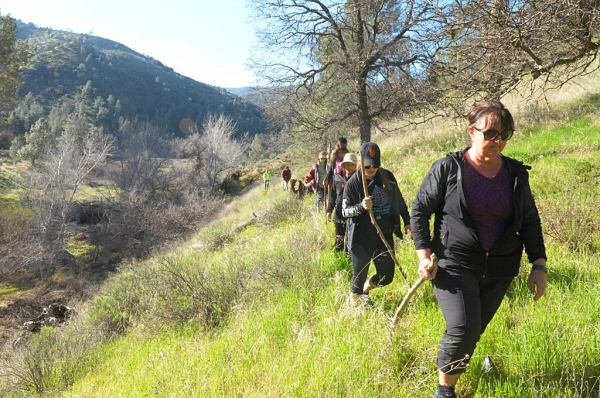 The next hike, rated as a "moderately strenuous" hike is scheduled for March 5 and are free to all.~photo by Elias Funez/The West Stanislaus Journal. 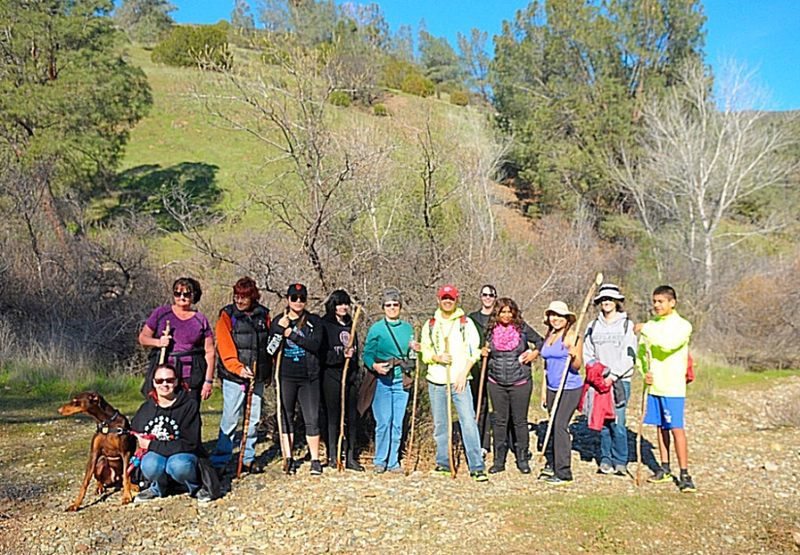 Going on its 6th year as a City of Patterson Parks and Recreation program, the Hikes for Health through the Minnear Day Use Area of Del Puerto Canyon seems to be growing in popularity as program coordinators continue to introduce local nature lovers to the flora and fauna available for all to enjoy in the lands of the hills bordering Patterson's western borders. 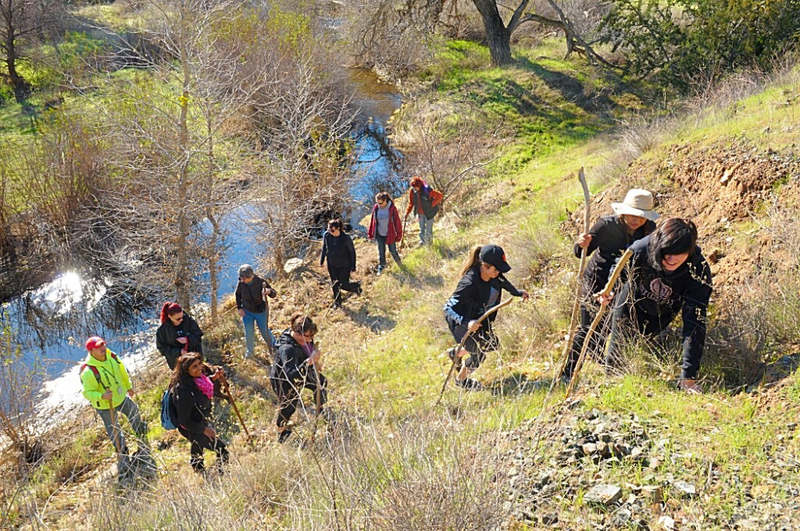 Originally designed in partnership with the Westside Health Care Task Force to get people out of the house and active in the outdoors, the free program has quickly become an opportunity for locals to learn about the natural history, geology, and biology of the lands directly to our west. 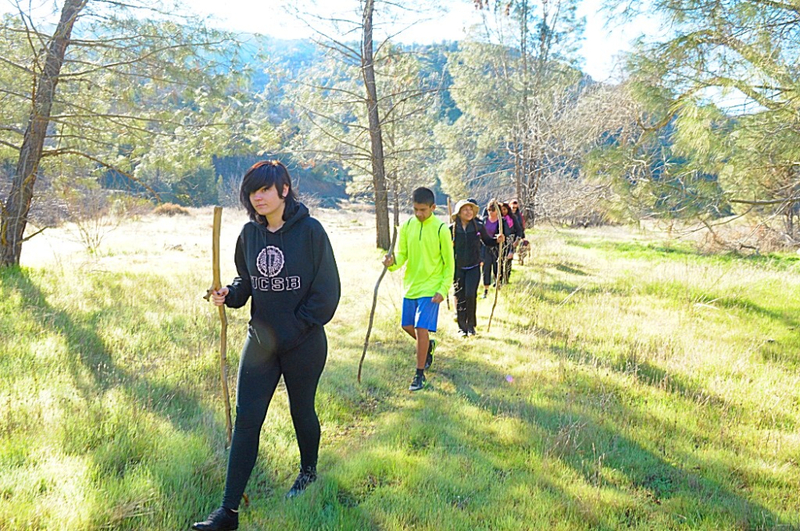 The first of the scheduled annual hikes, rated as an "easy" hike, took place Saturday February 6 and was designed with seniors and youth of all ages to be able to appreciate. A total of 13 hikers and one canine companion particpated, half of which had never been up Del Puerto Canyon before and had no idea of the beautiful natural resource made available to them. Wildflowers were beginning to bloom and the green grass was glowing in the bright sun as the flowing water of Del Puerto Creek could be heard babbling through the branches of the oaks and cottonwood trees along the trail. 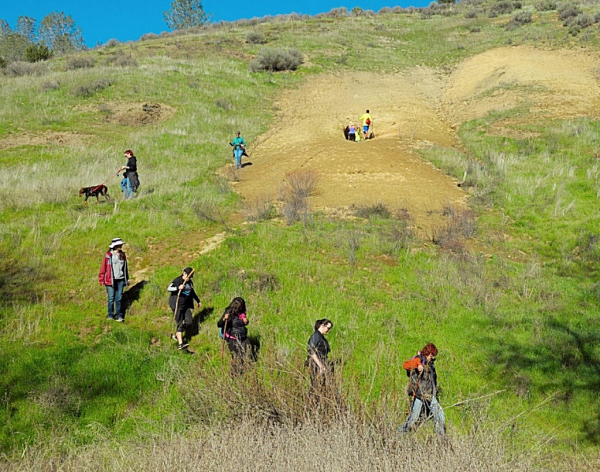 Folks who missed Saturday's hike need not worry for long though, as the second installation of the Hikes for Health program will take place on Saturday March 5. Rated as a "moderately strenuous" hike, the trail will lead hikers 2.5 miles from the western portion of the day use area, downstream along Del Puerto Creek to its confluence with the North Fork of Del Puerto Creek. Hikers who choose this trail will be shown an ancient Native American Yokuts indian oven, once used by the native peoples to bake bread and cook wild game and salmon that once spawned in the creek as well as be able to take in the scenery and native wildlife. 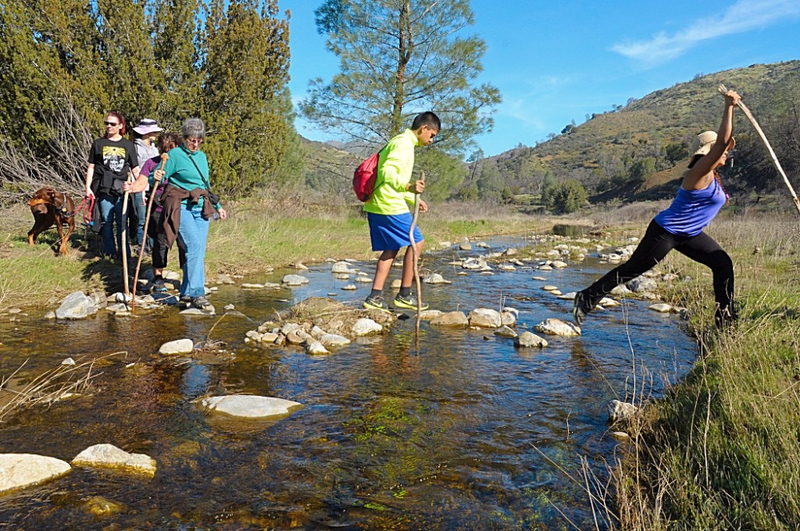 The "strenuous" and hardest hike of the program is planned for Saturday April 2, and will take participants on a roughly 4.2 mile hike and over 1,000 feet in elevation difference that will showcase some of the most scenic locations of Del Puerto Canyon. Portions of the trail are very rocky and could require some time to traverse, so this hike is recommended for those in good physical shape. 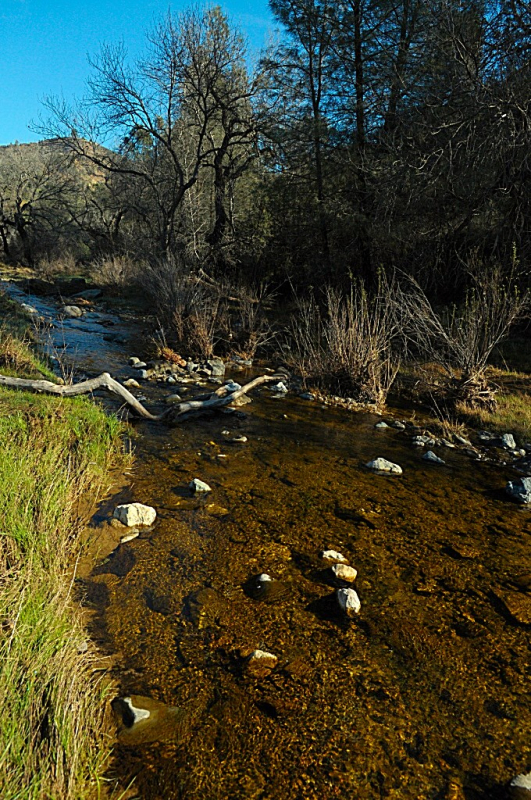 Hike coordinators recommend sturdy shoes for the hikes, as well as to bring along plenty of drinking water. A hiking stick is recommended for added stability, but one will be provided if need be. Participating hikers are asked to meet at the Hammon Senior Center on the morning of the hike and are slated to leave from the community complex by 8:30 a.m. where folks can carpool to the trailhead. 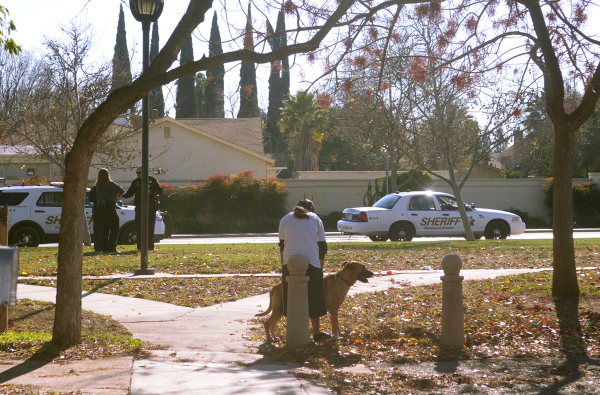 Questions or inquiries can be made with the city Parks and Recreation department at 209-895-8080. 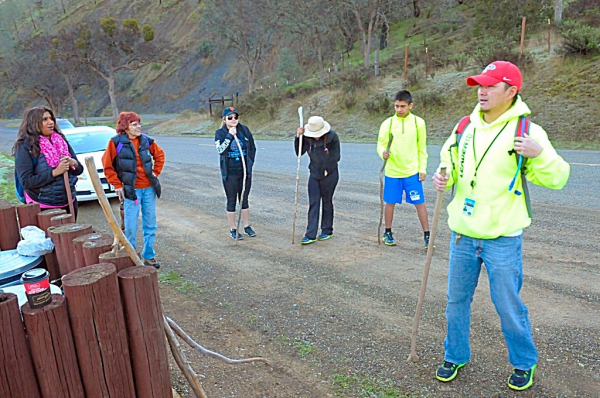 The City of Patterson's Johnny Nguyen (right), who also heads the Teen Outdoor Survival Skills (TOSS) program readies to accompany the group of hikers through a portion of the Minnear Day Use Area west of Patterson Saturday morning February 6 .~photo by Elias Funez/The West Stanislaus Journal. 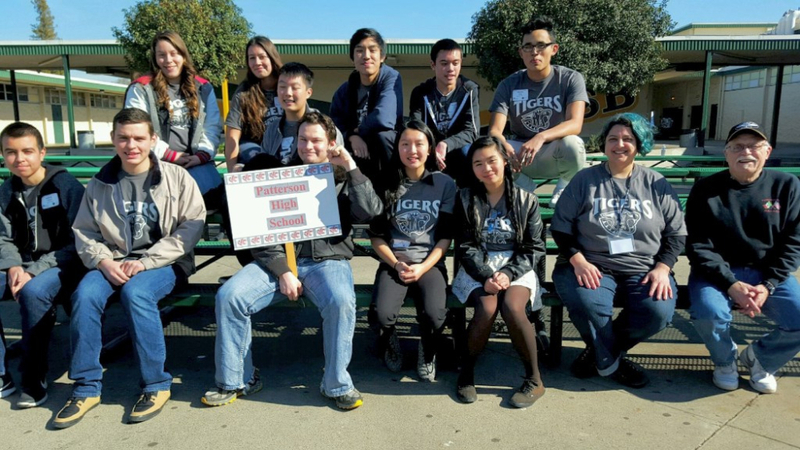 Patterson High School's Academic Decathlon team made quite an impression this last Saturday February 6 at Davis High School in Modesto. Taking second place in the Social Sciences Alternates Category was Tiffany Do, who also walked away from the competition with third place in the Language and Literature Alternates Category. Giselle Arroyo won fifth place in the Economics Alternates Category as well as fifth place in the Social Sciences Alternates Category. Ian Do received the fifth place designation in the Music Alternates Category, and Salvador Tello was the team high point winner. 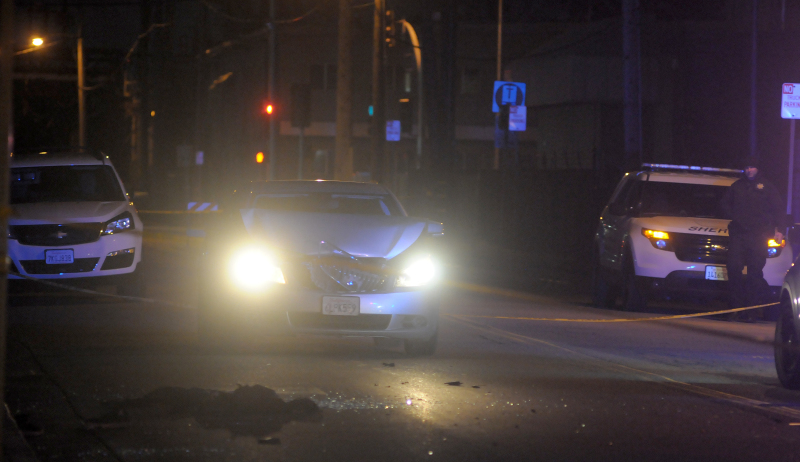 A Monday evening rash of shootings around Patterson left at least one person, with multiple gunshot wounds, airlifted out of Patterson to a nearby hospital on February 1. The condition of the man was unknown as of press time. 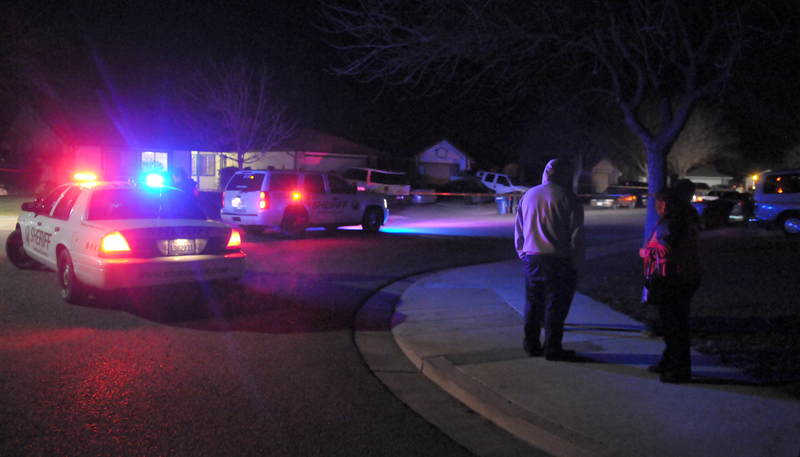 A shooting on the 500 block of Agadoni Ct. after 10:00 p.m. sent one man to the ER by medi-flight after being shot multiple times according to a Sergeant at the scene. The victims’ daughter and family who drove to the scene as soon as they heard of the incident were also waiting for an update as to the condition of the shooting victim. 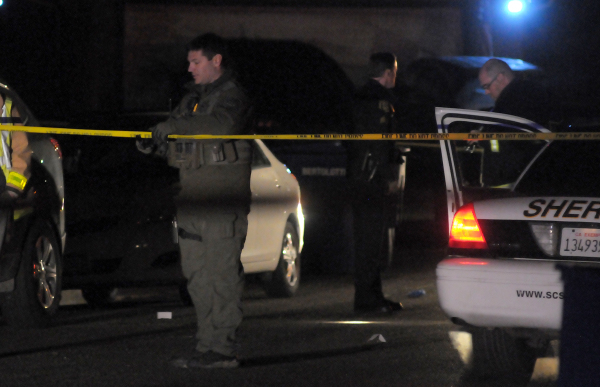 Sheriffs deputies that had been called in from the department’s main office helped out on the scene and cased the area for clues as they waited for the crime scene photographers to arrive. 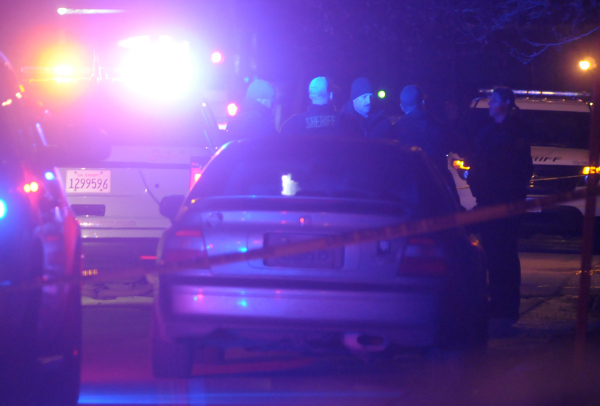 Witnesses in the area heard between 10 and 15 shots fired in relation to the Agadoni Ct. shooting. There have been other reports of a shooting at a dwelling in the Patterson Gardens area minutes prior to the Agadoni Ct. incident. 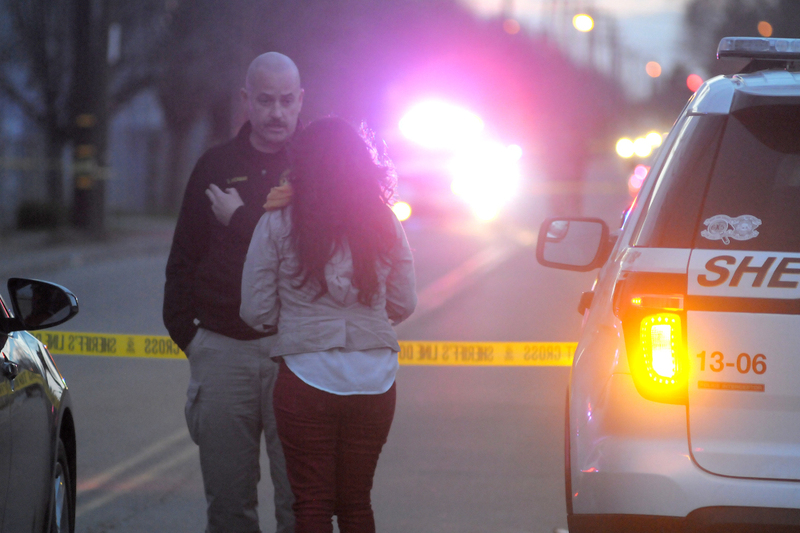 A witness at the scene close to the victim and his family mentioned that the shooting may have been a set up. More information will be updated to this article as it becomes available. 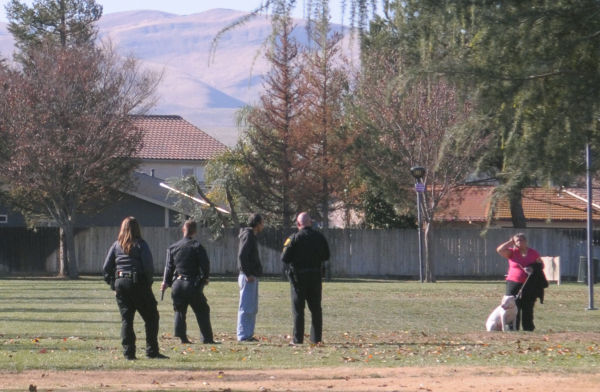 Authorities are still looking for the assailant(s) involved in the Agadoni Ct. shooting and any information regarding any of the recent shooting cases can be submitted anonymously to the Crime Stoppers tipline, 209- 521-4636. 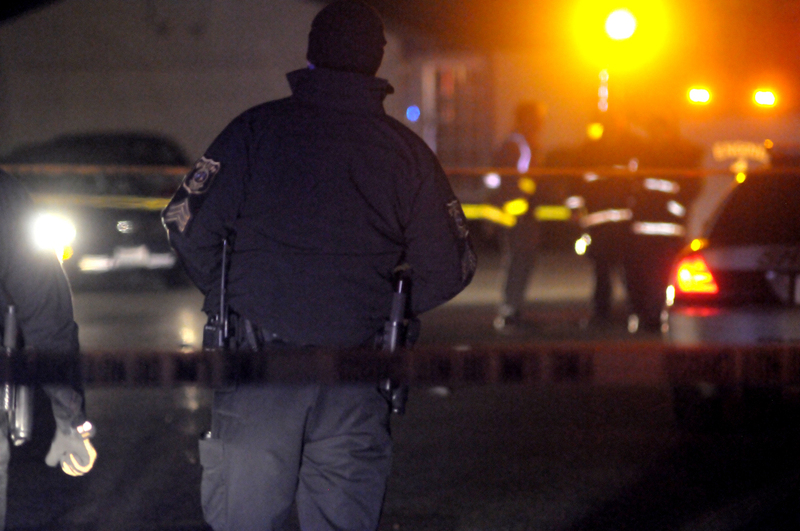 A series of shooting homicides left two dead and one in stable condition Sunday during a pair of separate incidents in Westley and in Patterson. 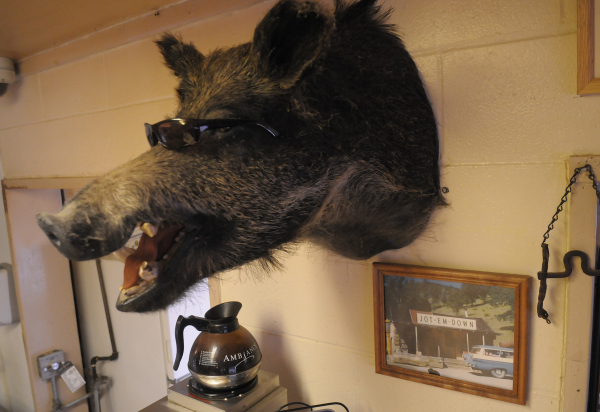 The first occurred around 2:00 a.m. Sunday morning in Westley at La Caverna bar off of Highway 33. 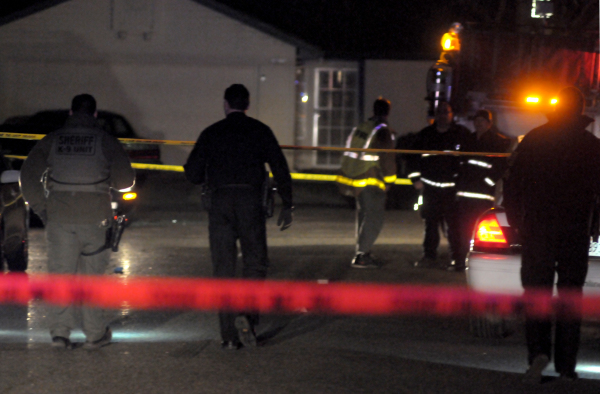 When deputies arrived, they found a gunshot wound to the upper body of 45 year old Salinas man Jorge Santana, and he was pronounced dead at the scene. 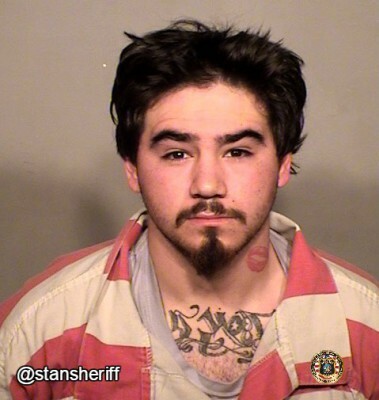 Deputies initially reported that they had no leads on the suspect(s), however a County Sheriff’s nixle report released Monday afternoon stated that 23 year old Antonio Cruz of Grayson was arrested on the 8800 block of Wilson Road in Grayson, on Sunday evening around 5:00 p.m. in relation to the early Sunday morning homicide. 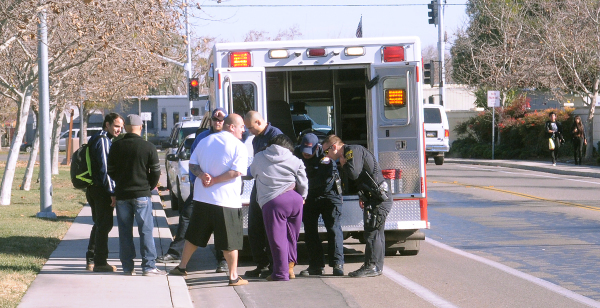 Meanwhile in Patterson, at around 4:20 p.m on Sunday January 31, a white four door pickup truck collided with a grey sedan on First Street just north of the intersection with Las Palmas Avenue. 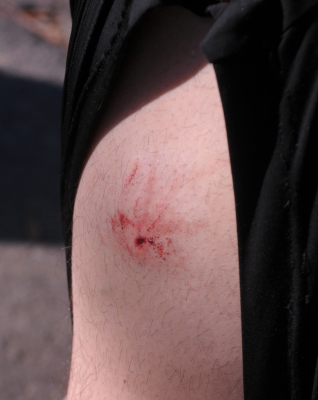 After immobilizing the sedan the assailant(s) from the white pickup truck fired shots at two hispanic males, whose identities and ages have not yet been released. Both men were transported to Doctors Medical Center where one man died and the other was listed in stable condition. Reports of Doctors Medical Center being placed on lockdown following a shooting in the vicinity of the hospital following the arrival of the two victims, has not been substantiated and inquiries to the DMC staff have not been returned as of press time. The stretch of North First Street in Patterson where Sunday evening’s shooting homicide occurred, sometimes referred to as “candyland” or “Buehner’s camps” is an area of the city that has historically been plagued with gang and other criminal activity. 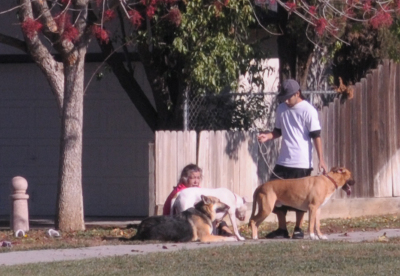 While the local authorities haven’t confirmed that the Patterson incident is indeed gang related or not, comments on local online forums and neighborhood watch groups from neighbors in the area believe that this was a gang related incident. This is the city of Patterson's first confirmed homcide for the 2016 year. Authorities are still on the look out for the white pickup truck and assailaint(s) involved in the Patterson shooting and any information regarding either of the homicide cases can be submitted anonymously to the Crime Stoppers tipline, 209- 521-4636. 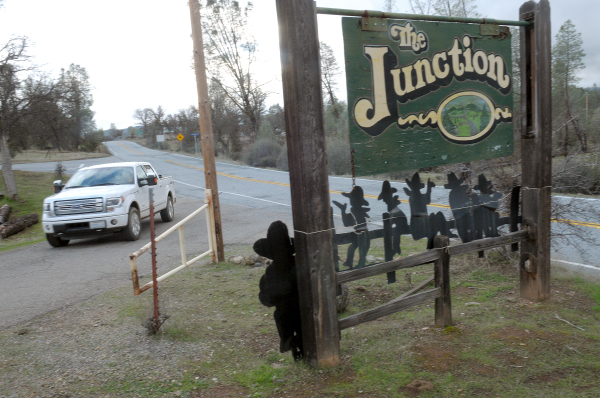 Fans of remote eastern Santa Clara county’s The Junction Bar and Grill, and those who have yet to discover its charm, have only a few days left to enjoy the rare and tasty eats with the likes of ostrich, elk, buffalo, wild boar, and of course beef on the menu , before the most recent ownership of The Junction closes its doors. 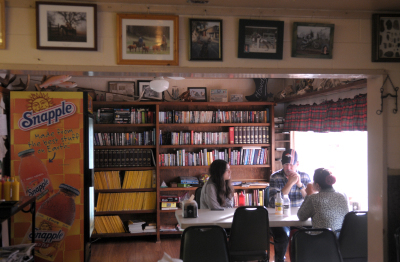 This Sunday January 31st will mark the final day that owner Mashelle Bullington and her crew will open their doors for business, just one month after celebrating their 2nd anniversary at the helm of the famous food and drink stop that sits in the middle of the Diablo Range, more than 30 miles away from the nearest locales of San Jose, Livermore, or Patterson. Properly named The Junction, since it is located in the San Antone Valley at the junction of the three long and winding roads that lead into the Diablo Range from the three aforementioned cities, the area is steeped in history and a rich culture that The Junction’s original owners helped to preserve by decorating the restaurant’s interior with ancient Native American artifacts, historical photos of the mining operations that took place near there in the early 1900’s, as well as many hundreds of images that locals and travelers have posted to The Junction’s poster board inside the restaurant. 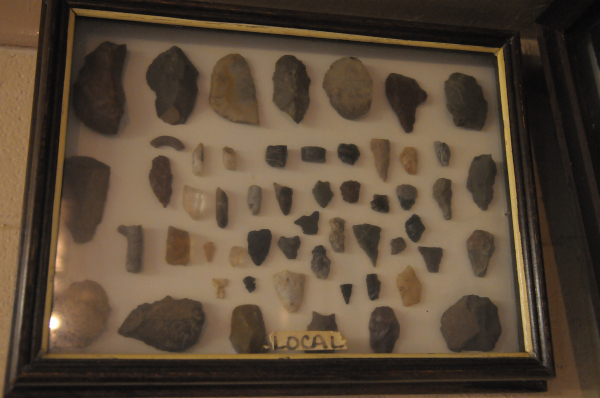 Of real interest to those who admire the local knowledge of the Native American Yokuts tibes that inhabited the hills to our west, is a collection of framed arrowheads and primitive tools with the label “local” on them. These precious finds are displayed next to another arrowhead collection marked “NE California” where the arrowheads consist almost entirely of obsidian rather to the local collection with rocks and quartz as the main source of the native’s tools. 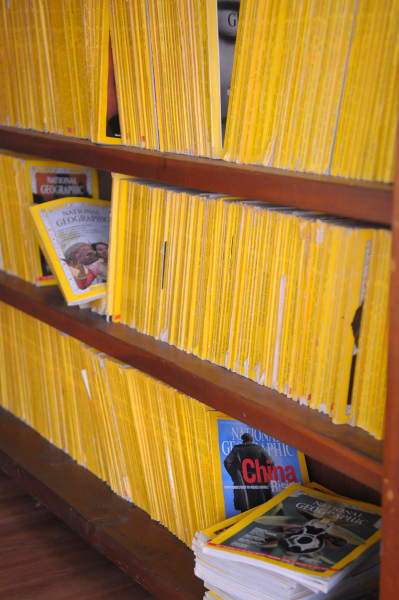 Folks don’t have to worry though, the images, artifacts, the extensive National Geographic Magazine collection, as well as the lending library, will stay with the building as they are owned by the property owners themselves and will remain if and when a new owner decides to step up to run The Junction. 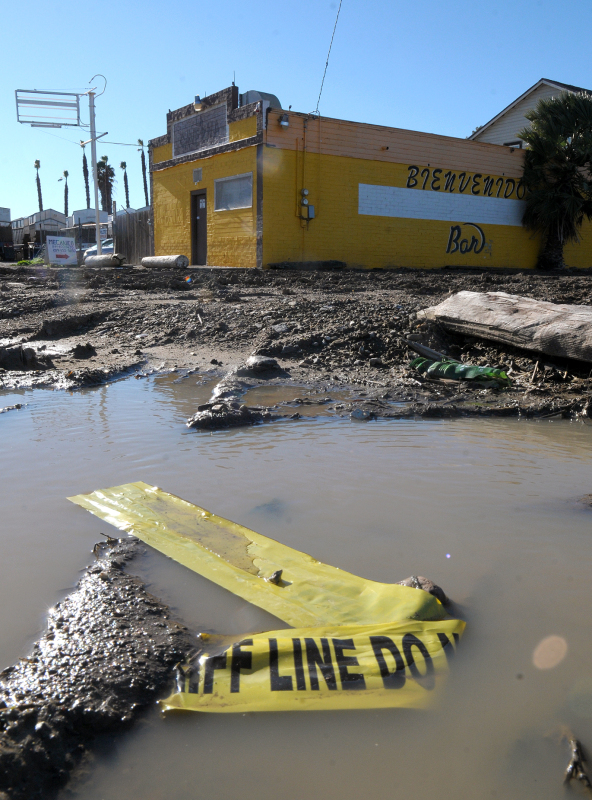 Bullington and Grahm explained how it had been an uphill battle over the past few years since they’ve run The Junction, with a series of road work projects that have compromised the safety of The Junction’s biggest customers, motorcyclists. Three years ago a Santa Clara County road crew worked large stretches of Alum Rock Road coming up from San Jose leaving loose gravel, a very dangerous hazard to cyclists, along the way according to Grahm. Two years ago, Alameda County repaved a large portion of Mines Road coming up from Livermore and just this last summer Santa Clara was at it again working on the roadway through the San Antone Valley, each time creating the same problem to cyclists. The roadwork also posed a problem to sports car enthusiasts, another big draw for The Junction, since the drivers didn’t tend to like tar and gravel tarnishing the paint jobs on their expensive vehicles. If that didn’t top it off, California’s severe drought lowered the water table in the San Antone Valley over the Summer of 2015, which ran the well that provides water to The Junction dry. This forced the owners of the business to shut down their restrooms to conserve water as a result. Thankfully by late October the water table had risen and water had been restored at full capacity to the site, allowing for full usage of the restrooms and facilities, which is a really good thing for business when you’re 30 miles away from the nearest clean restroom. The picturesque background that The Junction is situated in, the historic San Antone Valley, was once utilized by legendary Mexican Patriot Joaquin Murrieta when he and his men would drive 300 head of wild mustangs collected from all parts of Northern California, all the way to Sonora Mexico during the early 1850’s. 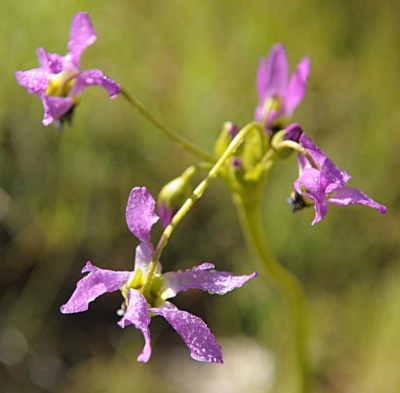 Now the gentle and meandering San Antone Valley is the home to one of California’s remaining wild Tule Elk populations, and can many times be seen grazing in the wildflower studded meadows of the San Antone. 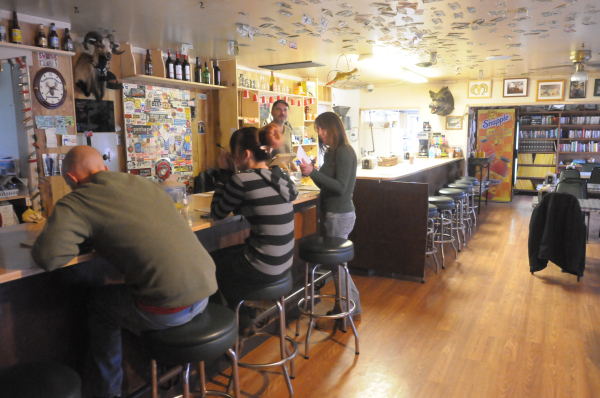 But aside from being one of the only places to get an ice cold beer, and eat a fat juicy burger, in a beautiful and historic setting, with the access of a clean restroom, Bullington and crew did a lot to mix things up a bit from the previous ownership. The aforementioned Elk, Buffalo, and Wildboar burgers were a nice touch considering the meats are much leaner than beef and oh so tasty. 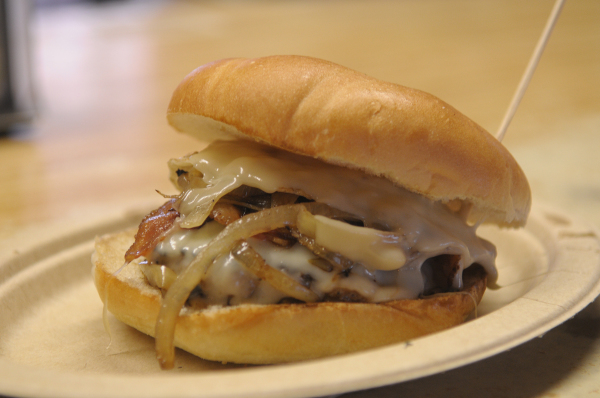 The locally grown ostrich meat used for the ostrich burger is an even newer addition that is said to be the best item on the menu. A wonderful selection of Altamont Beer Works was on tap (of which only a brown ale is still available). As well as a Karaoke night held Friday’s from 6-9 that was popular with the Locals. A collection of random items that might be needed by a potential customer such as a road bike tube, patch kit, tool set, motrin, or ear plugs also were made available. However, of greatest note by this author as to the positive change brought forth by the current ownership, was their acceptance of the “flatlanders”, during the weekday crowds, with less of the “locals only” feel I had felt with the previous owners. So if you’re up for the drive this weekend and are in search of an adventure rich in the natural beauty and history of our own backyard, take the drive 30 miles up Del Puerto Canyon Road to where the road ends at The Junction, just make sure you have plenty of gas and your vehicle is in good shape, as there are no servi ces at The Junction besides a great home cooked meal and an icy cold beverage, at least until this Sunday January 31. The gifts have been opened, the wrapping paper thrown away, and the little ones have been off and running enjoying their new toy or gadget provided to them this holiday season. 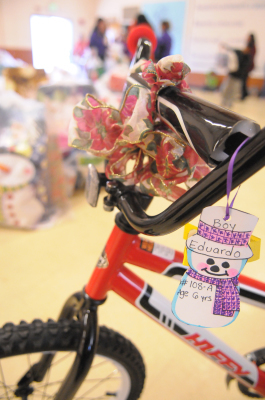 For many families, the holidays signify togetherness, community spirit, and gift giving. For many others, the holidays signify hardships, as struggling families strive to keep a roof over their heads and food on the table, let alone gifts under the tree. Fortunately for area residents of the Westside, the area offers many local charity organizations that step up year after year to help those less fortunate during the holidays. One of those organizations, The St. Vincent De Paul Society, has been providing gifts for the area's needy for 19 years now. The original concept for the St. Vincent De Paul giving tree started in 1996 by Sacred Heart Church’s Sister Ann Marie and 75 families were helped that year. This year around 500 families will be helped by the society of volunteers, though in the past, up to 800 families have been served. For St. Vincent De Paul society members, Ernie and Norma Munoz, who have spearheaded the project for the past 16 years, 2015 marks the final year that they will be in charge. 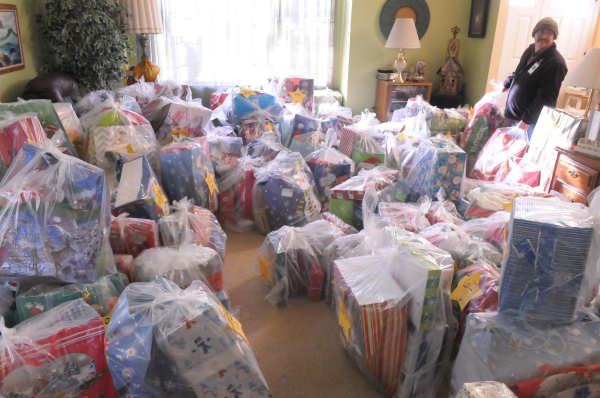 Every year the couple gives up the living space in their home to allow for the sorting of the thousands of wrapped gifts that they will give away, from the days after Thanksgiving, to December 12, when the gifts were distributed, there is little walking space in their home. 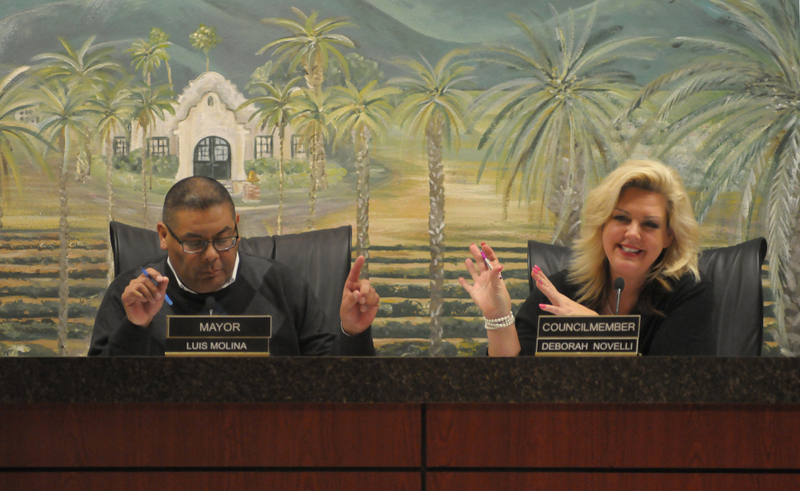 But just because the Munoz' are stepping down, doesn't mean the event will fall to the wayside. 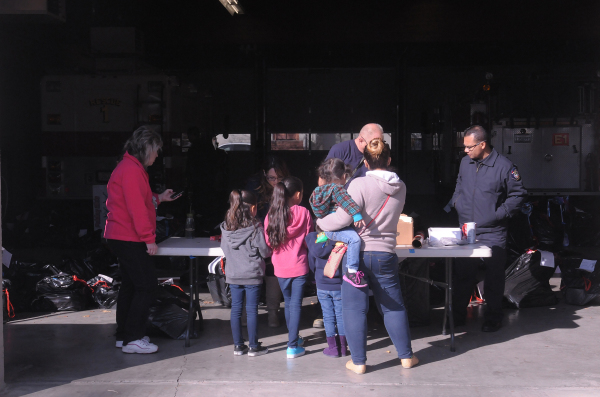 The Patterson Promotores, a relatively new local service organization, is ready to take over, as they were seen helping a lot during this year's event. Another up and coming charity organization is the Fire Department's Operation Santa Claus, which has been steadily builiding support for the past three years since firefighter Brandon Cousins has been at the helm. "Once again this community has been really good," Cousins said. "Next year we want to publicize it more." Cousins reported that the local businesses that donate do really well, and that they also receive monetary donations to help fulfill whatever else is needed. 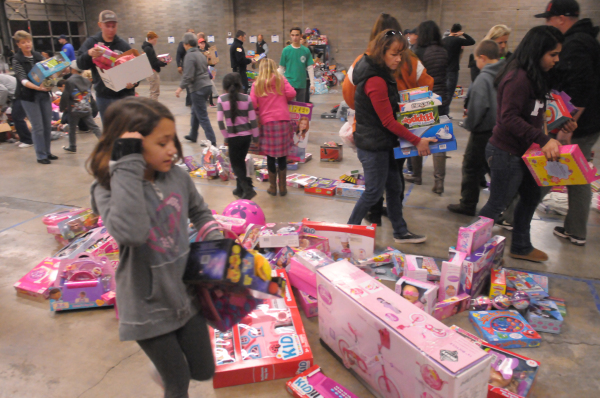 St. Vincent De Paul Society member Claudia Smith, who visited the Operation Santa giveaway on Friday December 18, noted how a random volunteer asked what they needed. She said she wasn't able to find any gloves and the next day $200 worth of brand new gloves were on her doorstep. Another person had donated about 30 crocheted hats, and didn't leave a name. "People care about those who are homeless," Smith said. 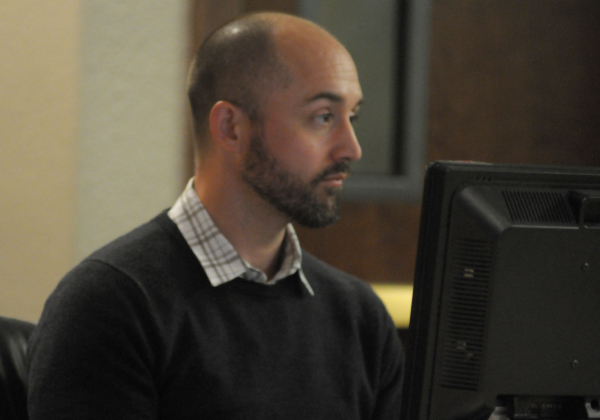 Jeff Lustgarten lost his job recently in 2015, working as a public affairs director for Metrolink rail in Southern California, after his employers were contacted about misinterpreted and false information regarding his involvement speaking up at city council meetings. 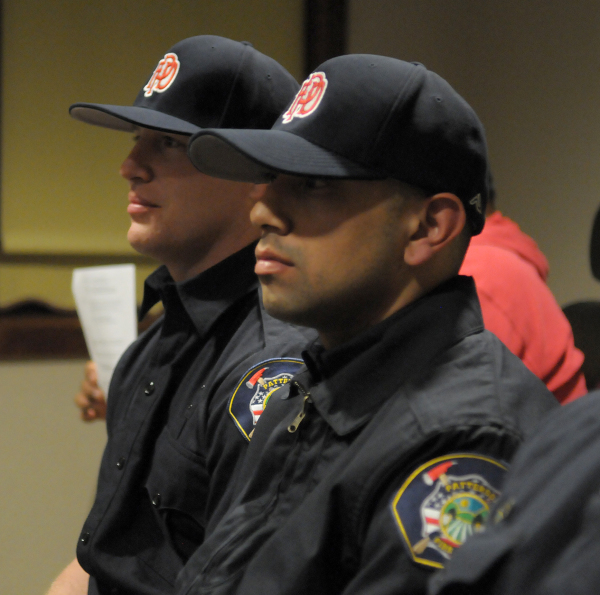 The morning of Thursday December 17, 2015 started out unlike any other, at least for one newborn boy who was delivered on Ossie Street behind Fire Station No. 1, and for Sheriff’s Deputy Kyle Briggs, who was the first to help young Isaias in to downtown Patterson. Patterson Fire Captain Mike Ambrosino, who was also one of the first on the scene, described the situation when his parents Hermenegilda and Maximo Nava arrived behind the police station. “During the night she must have went to the hospital, they said she’s not ready so they came back home. Labor and contractions started and on the way back to the hospital they decided they weren’t going to make it,” Ambrosino said. Ambrosino was first alerted by Chief Gregory that she was already going into labor, grabbed his medical bag, and noticed that Deputy Briggs was first with the expectant mother. Quickly the newborn baby boy was delivered in the front seat of the Nava’s car and in Deputy Briggs’ hands, before being handed off to Ambrosino who began to administer first aid to the newborn. Soon thereafter the color came back, oxygen was administered, and the baby gave a full healthy cry. Besides Ambrosino’s training on delivering babies, he said that he used to deliver 20 to 25 lambs every winter. “It’s similar,” Ambrosino said chuckling. Patterson Firefighter and Patterson District Ambulance medic Marty Greunke, who was on a shift with the ambulance Thursday morning was also quick to arrive on scene and helped cut the umbilical cord. 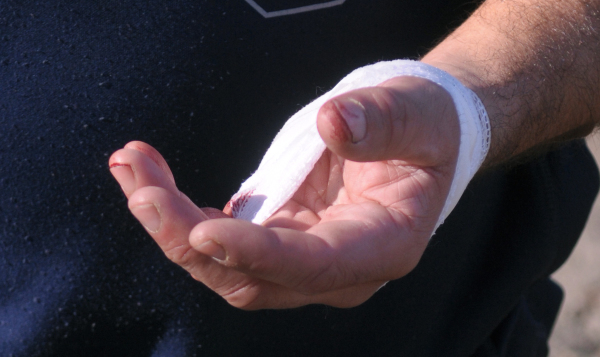 “I put mom on the gurney, gave baby to mom, and they were off,” Gruenke described. Hermenegilda and Isaias were then transported to Emanuel Medical Center in Turlock for additional care where it was reported that both were recuperating Thursday evening. For the first responders like Briggs, Ambrosino, Scott, and Greunke, they didn’t let their early morning work keep them from volunteering their time as they had originally planned to do that evening by helping to sort gifts along side the rest of their Patterson Fire extended family. 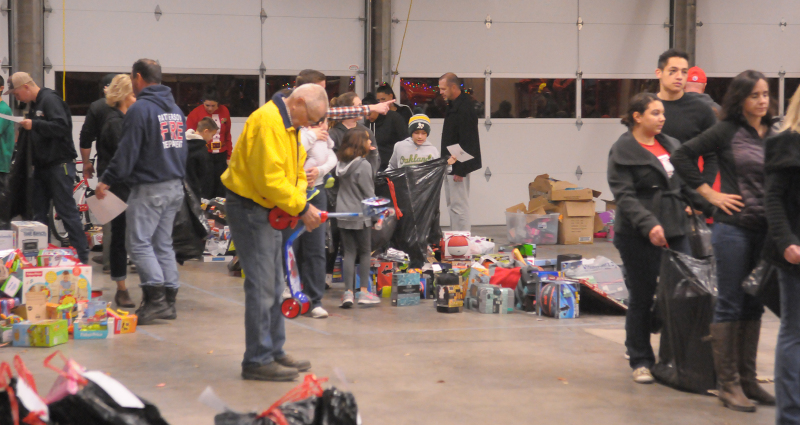 The gifts, being sorted for distribution to youngsters of all age ranges, are being given away as part of Patterson Fire’s annual Operation Santa. While no one was sure who the last baby born in Patterson was, since the closing of Del Puerto Hospital’s birthing ward in the 1980’s, firefighters Ambrosino and Scott did recall responding to a call in Patterson about a month ago where a woman was going into labor, however she delivered the child in the back of the ambulance on the way to the hospital and not in Patterson.